ABOVE: The Augustinian Monastery in Erfurt, Germany is also a conference center that welcomes church groups and independent travelers. Not too many hotels can make such a claim, but the Augustinerkloster in Erfurt, Germany doesn't call itself a hotel: It's a working Lutheran church and cloister that offers Sunday services, weekday prayer meetings, a 60,000-volume historical library, tours, a café, and a conference center with 51 comfortably equipped single and double rooms for visitors. 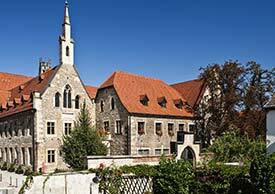 The monastery dates back to the 13th Century, when Augustinian monks settled in Erfurt. By the time Martin Luther joined the order in 1505, the Augustinerkloster was a respected center of Catholic learning with a theological college and an extensive library of books and manuscripts. However, after the Reformation, the monastery was secularized (the last monk died in 1556) and was occupied by a grammar school, a library, an orphanage, and a government assembly hall over the next three centuries until the church was restored and reconsecrated in 1851. In the 20th Century, restoration plans were interrupted by World War II. A British bombing raid destroyed much of the monastery on February 25, 1945, killing 267 people who had taken shelter in the cellars beneath the library. Reconstruction began in 1946, and a seminary occupied the buildings from 1960 until 1993. The Evangelical Church (as the Lutheran Church is known in Germany) subsequently completed restoration work on the church where Luther took his vows and turned the monastery's east and west wings into a conference center. Top photo: Thüringer Tourismus GmbH / Toma Babovic.